Suzaku has five light-weight thin-foil X-Ray Telescopes (XRTs). The XRTs have been developed jointly by NASA/GSFC, Nagoya University, Tokyo Metropolitan University, and ISAS/JAXA. These are grazing-incidence reflective optics consisting of compactly nested, thin conical elements. Because of the reflectors' small thickness, they permit high density nesting and thus provide large collecting efficiency with a moderate imaging capability in the energy range of 0.2-12 keV, all accomplished in telescope units under 20 kg each. Four XRTs onboard Suzaku (XRT-I) are used on the XIS, and the other XRT (XRT-S) is for the XRS. XRT-S is no longer functional. 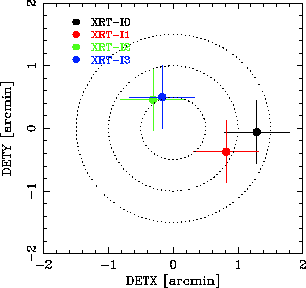 The XRTs are arranged on the Extensible Optical Bench (EOB) on the spacecraft in the manner shown in Figure 5.1. The external dimensions of the 4 XRT-Is are the same (See Table 5.1, which also includes a comparison with the ASCA telescopes). 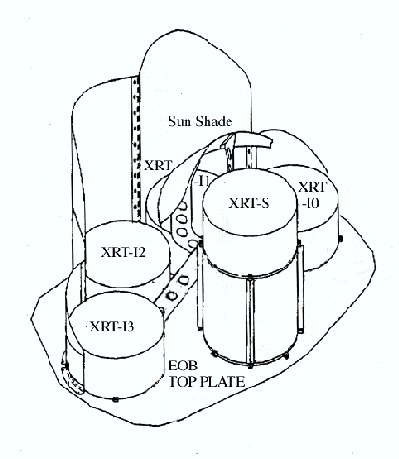 Figure 5.1: Layout of the XRTs on the Suzaku spacecraft. The Suzaku X-Ray Telescopes (XRTs) consist of closely nested thin-foil reflectors, reflecting X-ray at small grazing angles. An XRT is a cylindrical structure, having the following layered components: 1. a thermal shield at the entrance aperture to help maintain a uniform temperature; 2. a pre-collimator mounted on metal rings for stray light elimination; 3. a primary stage for the first X-ray reflection; 4. a secondary stage for the second X-ray reflection; 5. a base ring for structural integrity and interface with the EOB of the spacecraft. All these components, except the base rings, are constructed in 90 segments. Four of these quadrants are coupled together by interconnect-couplers and also by the top and base rings (Figure 5.2). The telescope housings are made of aluminum for an optimal strength to mass ratio. Each reflector consists of a substrate also made of aluminum and an epoxy layer that couples the reflecting gold surface to the substrate. Including the alignment bars, collimating pieces, screws and washers, couplers, retaining plates, housing panels and rings, each XRT-I consists of over 4112 mechanically separated parts. In total, nearly 7000 qualified reflectors were used and over 1 million cm of gold surface was coated. 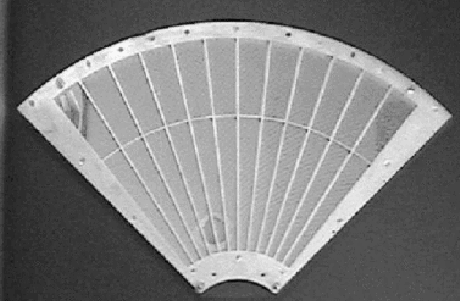 In shape, each reflector is a 90 segment of a section of a cone. The cone angle is designed to be the angle of on-axis incidence for the primary stage and 3 times that for the secondary stage. They are 101.6 mm in slant length and with radii extending approximately from 60 mm at the inner part to 200 mm at the outer part. The reflectors are nominally 178 m in thickness. All reflectors are positioned with grooved alignment bars, which hold the foils at their circular edges. There are 13 alignment bars at each face of each quadrant, separated at approximately 6.4 apart. To properly reflect and focus X-ray at grazing incidence, the precision of the reflector figure and the smoothness of the reflector surface are important aspects. Since polishing of thin reflectors is both impractical and expensive, reflectors in Suzaku XRTs acquire their surface smoothness by a replication technique and their shape by thermo-forming of aluminum. In the replication method, metallic gold is deposited on extrusion glass mandrel (``replication mandrel''), of which the surface has sub-nanometer smoothness over a wide spatial frequency, and the substrate is subsequently bonded with the metallic film with a layer of epoxy. After the epoxy is hardened, the substrate-epoxy-gold film composite can be removed from the glass mandrel and the replica acquires the smoothness of the glass. The replica typically has 0.5 nm rms roughness in the mm or smaller spatial scale, which is sufficient for excellent reflectivity at incident angle less than the critical angle. The Suzaku XRTs are designed with on-axis reflection at less than critical angle, which is approximately inversely proportional to X-ray energy. In the thermo-forming of the substrate, pre-cut, mechanically rolled aluminum foils are pressed onto a precisely shaped ``forming mandrel'', which is not the same as the replication mandrel. The combination is then heated until the aluminum softened. The aluminum foils acquire the figure of the properly shaped mandrel after cooling and release of pressure. In the Suzaku XRTs, the conical approximation of the Wolter-I type geometry is used. This approximation fundamentally limits the angular resolution achievable. More significantly, the combination of the figure error in the replication mandrels and the imperfection in the thermo-forming process (to about 4 micrometers in the low frequency components of the figure error in the axial direction) limits the angular resolution to about 1 minute of arc. 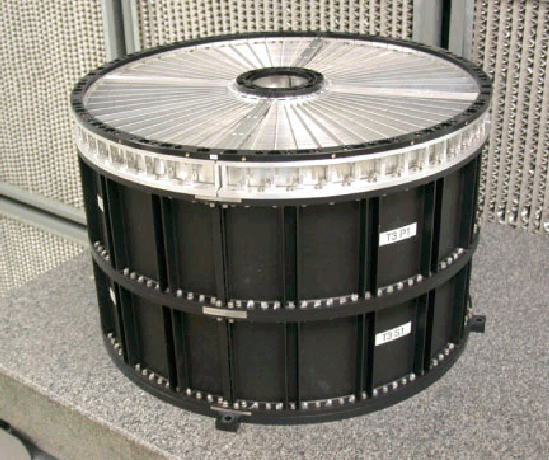 The pre-collimator, which blocks off stray light that otherwise would enter the detector at a larger angle than intended, consists of concentrically nested aluminum foils similar to that of the reflector substrates. They are shorter, 22 mm in length, and thinner, 120 micrometers in thickness. They are positioned in a fashion similar to that of the reflectors, by 13 grooved aluminum plates at each circular edge of the pieces. They are installed on top of their respective primary reflectors along the axial direction. Due to their smaller thickness, they do not significantly reduce the entrance aperture in that direction more than the reflectors already do. Pre-collimator foils do not have reflective surfaces (neither front nor back). The relevant dimensions are listed in Table 5.2. The Suzaku XRTs are designed to function in a thermal environment of 20 7.5 C. The reflectors, due to its composite nature and thus its mismatch in coefficients of thermal expansion, suffer from thermal distortion that degrades the angular resolution of the telescopes in temperature outside this range. 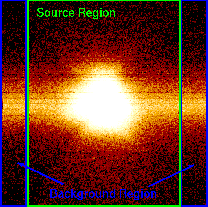 Thermal gradient also distorts the telescope in a larger scale. Even though sun shields and other heating elements on the spacecraft help in maintaining a reasonable thermal environment, thermal shields are integrated on top of the pre-collimator stage to provide the needed thermal control. Figure 5.3: A thermal shield. In this section we describe in-flight performance and calibration of the Suzaku XRTs. There are no data to verify the in-flight performance of the XRT-S, therefore we hereafter concentrate on the four XRT-I modules (XRT-I0 through I3) which focus incident X-rays on the XIS detectors. A point-like source MCG 6 30-15 were observed at the XIS aimpoint during August 17-18. Figure 5.4 shows the focal position of the XRT-Is, that the source is focused when the satellite points at the XIS aimpoint. The focal positions are located roughly within from the detector center with an deviation of . This implies that the fields of view of the XIS coincides each other within . Figure 5.4: Focal positions at the XISs when the satellite points MCG 6 30-15 at the XIS aimpoint. The maximum transmission of each telescope module is achieved when a target star is observed along the optical axis. The optical axes of the four XRT-I modules are, however, expected to scatter in an angular range of 1 . Accordingly, we have to define the axis to be used for real observations that gives reasonable compromise among the four optical axes. We hereafter refer to this axis as the observation axis. In order to determine the observation axis, we have first searched for the optical axis of each XRT-I module by observing the Crab nebula at various off-axis angles. The observations of the Crab nebula were carried out in the following three groups of time. 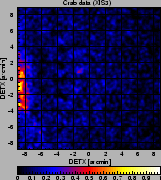 Hereafter all the off-axis angles are expressed in the detector coordinate system DETX/DETY (see ). 2005 Aug. 22 03:30UT - 15:33UT: a short observation near the center of the detectors, which is defined as the origin of the DETX/DETY scheme, until 06:00UT followed by the four -off observations at and . 2005 Aug. 24 23:58UT - Aug. 27 07:30UT: a series of the off-axis observations at , , , , , , and . 2005 Sep. 15 01:00UT - Sep. 16 08:50UT: pointings at the XIS default position and the HXD default position as well as the remaining three off pointings at and . Note that the field of view of the XIS detector is a square with on a side. Thus only the data taken at the origin, at -off and at -off are available for determining the optical axes. By fitting a model comprising of a Gaussian plus a constant to the data of counting rate as a function of the off-axis angle, we have determined the optical axis of each XRT-I module. The result is shown in Fig. 5.5. Figure 5.5: Locations of the optical axis of each XRT-I module in the focal plane determined from the observations of the Crab nebula in 2005 August-September. This figure implies that the image on each XIS detector becomes brightest when a target star is placed at the position of the corresponding cross. The dotted circles are drawn every in radius from the XIS-default position (see text). Since the optical axes moderately scatter around the origin, we have decided to adopt it as the observation axis for XIS-oriented observations as the default. Hereafter we refer to this axis as the XIS-default orientation, or equivalently, the XIS-default position. 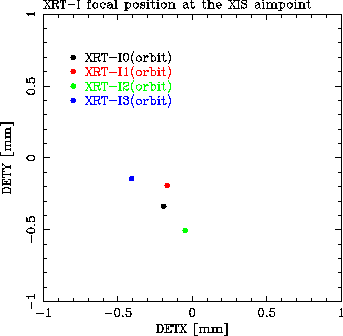 The optical axis of XRT-I0 shows the largest deviation of from the XIS-default position. Nevertheless, the efficiency of XRT-I0 at the XIS-default position is more than 97% even in the highest 8-10 keV band (see Fig. 5.8). The optical axis of the HXD PIN detector, on the other hand, is deviated by 5 in the negative DETX direction (see for example, the instrument paper at ). Because of this, the observation efficiency of the HXD PIN at the XIS-default orientation is reduced to 93% of the on-axis value. We thus provide the other default pointing position, the HXD-default position, for HXD-oriented observations, at in the DETX/DETY coordinate. At the HXD-default position, the efficiency of the HXD PIN is nearly 100%, whereas that of the XIS is 88% on the average. In-flight calibration of the effective area has been carried out with the version 0.7 processed data (see ) of Crab nebula both at the XIS/HXD-default positions. The observations were carried out in 2005 September 15-16 (§3.1). The data were taken in the normal mode with the 0.1 s burst option in which the CCD is exposed during 0.1 s out of the full-frame read-out time of 8 s, in order to avoid the event pile-up and the telemetry saturation. The exposure time of 0.1 s is, however, comparable to the frame transfer time of 0.025 s. As a matter of fact, the Crab image is elongated in the frame-transfer direction due to so-called the out-of-time events, as shown in Fig. 5.6. Figure 5.6: The source- and background-integration regions overlaid on the Crab images taken with XIS1 at the XIS-default position (left) and the HXD-default position (right) on 2005 September 15-16. The images are elongated in the frame-transfer direction due to the out-of-time events (see text). In order to cancel these events, the background regions with a size of 126 by 1024 pixels each are taken at the left and right ends of the chip for the XIS-default position, and a single region with a size of 252 by 1024 pixels is taken at the side far from the Crab image for the HXD-default position. The remaining source-integration region has a size of 768 by 1024 pixels, or . The background subtraction is carried out after after area-size correction. Accordingly, the background-integration regions with a size of 126 by 1024 pixels are taken at the left and right ends of the chip for the XIS-default position, perpendicularly to the frame-transfer direction, as shown in the left panel of Fig. 5.6. For the observation at the HXD-default observation, the image center is shifted from the XIS-default position in the direction perpendicular to the frame-transfer direction for XIS0 and XIS3. Hence we can adopt the same background-integration regions as those of the XIS-default position for these two XIS modules. For XIS1 and XIS2, on the other hand, the image shift occurs in the frame-transfer direction, as shown in the right panel of Fig. 5.6. We thus take a single background-integration region with a size of 252 by 1024 pixels at the far side from the Crab image for the HXD-default position of these two detectors. As a result, the remaining source-integration region has a size of 768 by 1024 pixels, or for all the cases, which is wide enough to collect all the photons from the Crab nebula. After subtracting the background, taking into account the sizes of the regions, we have fitted the spectra taken with the four XIS modules with a model composed of a power law undergoing photoelectric absorption using XSPEC Version 11.2. For the photoelectric absorption, we have adopted the model phabs with the cosmic metal composition (Anders & Grevesse 1989, Geochim. Cosmochim. Acta, 53, 197) First of all, we set all the parameters free to vary independently for all the XIS modules. The results are summarized for the XIS/HXD nominal positions separately in table 5.3, and are shown in Fig. 5.7. Table 5.3: Best-fit parameters of the power law model to the Crab spectra taken in 2005 September 15-16. Figure 5.7: Power-law fit to the Crab spectra of all the four XIS modules taken at the XIS-default position. All the parameters are set free to vary independently for each XIS module. The fit is carried out in the 1.0-10.0keV band but excluding the interval 1.5-2.0 keV where a large systematic error associated with the Si K-edge remains, and the other channels are retrieved after the fit. In doing the fit, we have adopted ae_xi_20060213.rmf as the RMF, and ae_xi_xisnom6_20060615.arf or ae_xi_hxdnom6_20060615.arf as the ARF. These ARFs are made for a point source, whereas the Crab nebula is slightly extended ( 2 ). We thus have created ARFs by utilizing the ray-tracing simulator (Misaki et al. 2005, Appl Opt, 44, 916) with a Chandra image as the input, and have confirmed that the difference of the effective area between these two sets of ARFs is less than 1%. We have neglected the energy channels below 1 keV, above 10 keV, and in the 1.5-2.0 keV band because of insufficient calibration related to uncertainties of the nature and the amount of the contaminant on the OBF and Si edge structure (see ). Those energy channels are retrieved after the fit and shown in Fig. 5.7. Toor & Seward (1974, AJ, 79, 995) compiled the results from a number of rocket and balloon measurements available at that time, and derived the photon index and the normalization of the power law of the Crab nebula to be and 9.7 photons cm s keV at 1 keV, respectively. Overlaying photoelectric absorption with cm , we obtain the flux to be erg cm s in the 2-10 keV band. The best-fit parameters of all the XIS modules at the XIS-default position are close to these standard values. Although those at the HXD-default position show similar values, the fluxes of XIS0 and XIS1 are smaller than the standard value by 6-7 %. 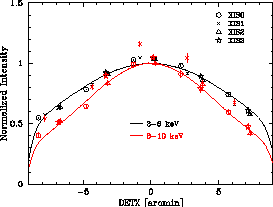 Since the optical axes of these two detectors are farther away from the HXD-default position than those of the other two (Fig. 5.5), this may be due to insufficient calibration of the optical axes and/or the vignetting. Since the best-fit parameters of the four XIS modules are close to the standard values, we have attempted to constrain the hydrogen column density and the photon index to be common among all the detectors. The best-fit parameters are summarized in table 5.4. Table 5.4: Best-fit parameters of the contemporaneous power-law fit to the Crab spectra taken in 2005 September 15-16. The hydrogen column density (0.32-0.33) cm and the photon index 2.09 0.01 are consistent with the standard values. The vignetting curves calculated by the ray-tracing simulator is compared with the observed intensities of the Crab nebula at various off-axis angles in Fig. 5.8. Figure 5.8: Vignetting of the four XRT-I modules using the data of the Crab nebula taken during 2005 August 22-27 in the two energy bands 3-6 keV and 8-10 keV. The model curves are calculated with the ray-tracing simulator with the spectral parameters of cm , photon index = 2.09, and the normalization = 9.845 photons cm s keV at 1 keV. Note that the abrupt drop of the model curves at 8 is due to the source approaching the detector edge. See the text for more detail. The excess of the data points of XIS1 is probably due to insufficient calibration of the backside-illuminated CCD. We have utilized the data of the Crab nebula taken during 2005 August 22-27 to search for the optical axis of each XRT. In the figure, we have drawn the vignetting curves in the two energy bands 3-6 keV and 8-10 keV. To obtain this, we first assume the spectral parameters of the Crab nebula to be a power law with cm , photon index = 2.09, and the normalization = 9.845 photons cm s keV at 1 keV. These values are the averages of the four detectors at the XIS-default position (table 5.4). We then calculate the counting rate of the Crab nebula on the entire CCD field of view in every step both in the DETX and DETY directions using the ray-tracing simulator. Note that the abrupt drop of the model curves at 8 is due to the source approaching the detector edge. On the other hand, the data points provide the real counting rates in the corresponding energy bands within an aperture of by . They consist of the observations at the five different off-axis angles , , and both in DETX and DETY directions, where the origin is the XIS-default position. Note that the aperture adopted for the observed data can collect more than 99% of the photons from the Crab nebula, and hence the difference of the integration regions between the simulation and the observation does not matter. Finally, we renormalize both the simulation curve and the data so that the counting rate of the simulation curve at the origin becomes equal to unity. These figures roughly show that the effective area is calibrated within 5% over the XIS field of view, except for the 8-10 keV band of XIS1. The excess of the data point at the XIS-default position is already seen in Fig. 5.7. Although the reason for these excess is unclear, it is probably associated with insufficient calibration of the backside-illuminated CCD. Verification of the imaging capability of the XRTs has been made with the data of SS Cyg in quiescence taken during 2005 November 2 01:02UT-23:39UT. The total exposure time was 41.3 ks. SS Cyg is selected for this purpose because it is a point source and moderately bright (3.6, 5.9, 3.7, and 3.5 c s for XIS0 through XIS3), and hence, it is needless to care about pile-up even at the image core. In evaluating the imaging capability, it is found that variation of relative alignment between the XRT system and the Attitude and Orbit Controlling System (AOCS) becomes a significant problem. The variation is synchronized with the orbital motion of the spacecraft. This phenomenon is now understood to be due to the thermal distortion by the bright-earth illumination of the side panel #7 on which the instruments to measure the attitude of the spacecraft (the star trackers and the gyros) are mounted. The amplitude of the variation is as large as 50 at most, which cannot be neglected in evaluating the imaging capability. A series of software to correct this alignment variation has been developed. In the meanwhile, we simply accumulate the data taken while the pointing of the XRT is stable. In Fig. 5.9, we show the image, the Point-Spread Function (PSF), and the EEF of all the XRT-I modules thus obtained. Figure 5.9: Image, Point-Spread Function (PSF), and EEF of the four XRT-I modules in the focal plane. All the images are binned with 2 2 pixels followed by being smoothed with a Gaussian with a sigma of 3 pixels, where the pixel size is 24 m. The EEF is normalized to unity at the edge of the CCD chip (a square of on a side). With this normalization, the HPD of the XRT-I0 through I3 is , , , and , respectively. Due to this treatment, however, the total exposure time is reduced to be 9.1 ks. The HPD is obtained to be , , , and for XRT-I0, 1, 2, and 3, respectively. These values are in general consistent with those expected from ground-based calibration measurements. Observation of the stray light are carried out with the Crab nebula during 2005 August 22 - September 16 at the off-axis angles of , , , and in (DETX, DETY). 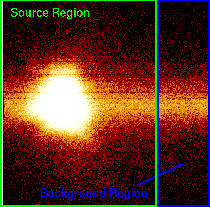 An example of the stray-light image is shown in the right panel of Fig. 5.10. Figure 5.10: Focal plane images formed by stray lights. The left and middle panels show simulated images of a monochromatic point-like source of 4.51 keV locating at in (DETX, DETY) in the cases of without and with the pre-collimator, respectively. The radial dark lanes are the shades of the alignment bars. The right panel is the in-flight stray image of the Crab nebula in the 2.5-5.5 keV band located at the same off-axis angle. The unit of the color scale of this panel is counts per 16 pixels over the entire exposure time of 8428.8 s. The counting rate from the whole image is 0.78 0.01 c s including background. Note that the intensity of the Crab nebula measured with XIS3 at the XIS-default position is 458 3 c s in the same 2.5-5.5 keV band. All the images are binned with 2 2 pixels followed by being smoothed with a Gaussian with a sigma of 2 pixels, where the pixel size is 24 m.
This image is taken with XIS3 in the 2.5-5.5 keV band when the Crab nebula is offset at in (DETX, DETY). The left and central panels show simulated stray light images without and with the pre-collimator, respectively, of a monochromatic point source of 4.5 keV being located at the same off-axis angle. The ghost image seen in the left half of the field of view is due to the ``secondary reflection''. Although the ``secondary reflection'' cannot completely be diminished at the off-axis angle of , the center of the field of view is nearly free from the stray light. 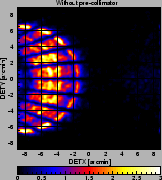 The semi-circular bright region in the middle panel, starting from (DETX, DETY) = through ( ) where the image becomes fainter, and ending up at , originates from the innermost secondary reflector, because the space between the innermost reflector and the inner wall of the telescope housing is much larger than the reflector-reflector separation. This semi-circular bright region is marginally visible in the real Crab nebula image in the right panel. Another remarkable difference between the simulation and the real observation is the location of the brightest area; in the simulation, the left end of the image (DETX , ) is relatively dark whereas the corresponding part is brightest in the Crab nebula image. These differences originate from relative alignments among the primary and secondary reflectors, and the blades of the pre-collimator, which are to be calibrated by referring to the data of the stray light observations in the near future. In-flight stray-light observations were carried out with Crab at off-axis angles of (4 pointings), (4 pointing) and (4 pointing) in August and September. We show an example of -off image of XRT-I3 together with simulation results of the same off-axis angle for the cases with and without the pre-collimator in Fig. 5.10. It is seen that the pre-collimator works for reducing the stray light in orbit. 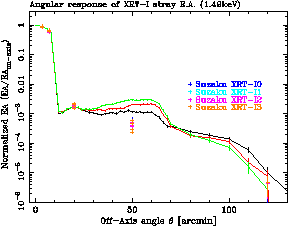 Figure 5.11 shows angular responses of the XRT-I at 1.5 and 4.5 keV up to 2 degrees. The effective area is normalized at on-axis. The integration area is corresponding to the detector size of XIS ( ). The plots are necessary to plan observations of diffuse sources or faint emissions near bright sources, such as outskirts of cluster of galaxies, diffuse objects in the Galactic plane, SN 1987A, etc. The three solid lines in the plots correspond to different parameters of ray-tracing program while the crosses are the normalized effective area using the Crab pointings. For example, the effective area of the stray lights at 1.5 keV is 10 at angles smaller than 70 arcmin off axis and at angles larger than 70 arcmin off. The measured flux of stray lights are in good agreement with that of raytracing within an order. The solution of the black line is incorporated in the xissim for the AO2 simulation. 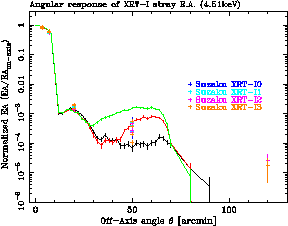 Figure 5.11: Angular responses of the XRT-I at 1.5 (left) and 4.5 keV (right) up to 2 degrees. The effective area is normalized at on-axis. 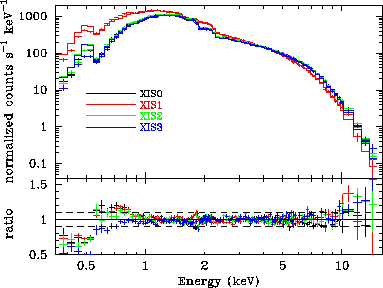 The integration area is corresponding to the detector size of XIS ( ). The three solid lines in the plots correspond to different parameters of ray-tracing program while the crosses are the normalized effective area using the Crab pointings.